I was lucky to start the month of May with some time off from school. May 1st is Labor Day, and a holiday for all EPIK teachers. Since May 5th is Children's Day in Korea, most schools also took May 4th (the Monday) off since it was sandwiched between the weekend and the holiday. If that long weekend wasn't exciting enough, this year most schools took a few extra days off after Children's Day as well. In my case, I didn't have to go to school again until Friday. Since a lot of the red days (national holidays) in the summer fall on weekends this year, schools were allowed (even encouraged) to take a few days off so that students wouldn't be in school for more days than they're supposed to be. When I got back from my trip to Beijing, I wasn't expecting to have another chance to travel until August, so once I found out I had nearly a week off, it didn't take long for me to start making plans. One of the places I had wanted to go but didn't think I was going to have a chance to go to was the Philippines. Since I did so much traveling in the winter, I was more interested in having a laid back kind of vacation--less focused on sightseeing and more focused on the beach. I booked this trip with one of my friends from town, and although we weren't expecting it, there weren't a ton of flights available to the Philippines leaving during the times we wanted. Due to the lack of options for flight times in a reasonable price bracket, we ended up taking an overnight flight from Seoul to Manila, then a very early morning flight to Boracay. 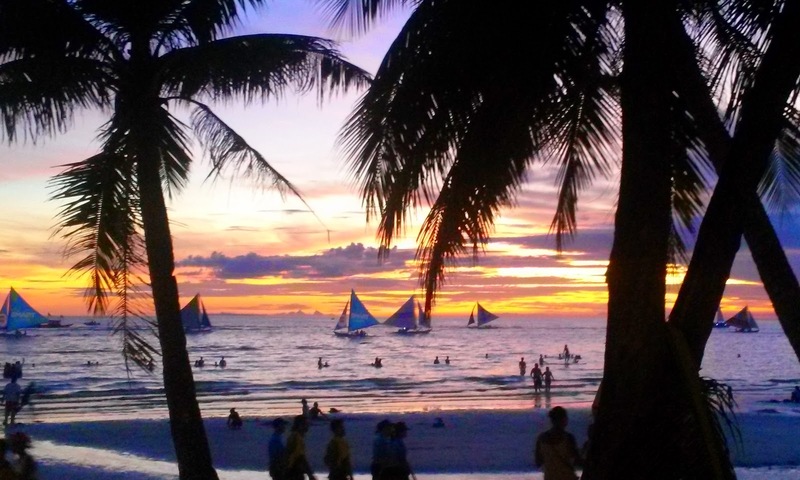 Boracay is the resort hub of the Philippines and is famous for its clear, blue water and white sand beaches, so we figured even if we had to stay up all night, we could rest on the beach once we arrived. Our flight from Seoul to Manila ended up being terribly uncomfortable. We flew Cebu Pacific, a budget airline, so we weren't expecting the best flight, but we weren't ready for the way in which the lights were never turned off and the flight attendants constantly were trying to sell things to us throughout the flight. 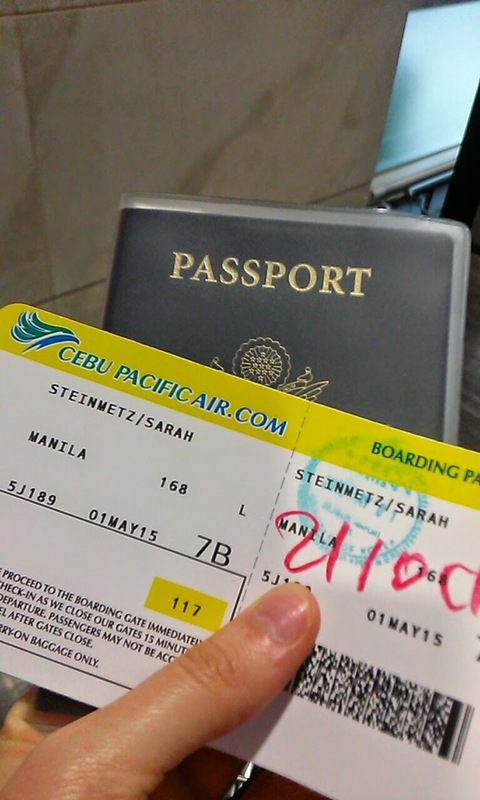 We got to Manila around 12:30 AM, and our flight to Boracay didn't leave until about 5:30 AM. We found an empty area where we could rest a little, but even for an airport, it was remarkably uncomfortable. Apparently the airport doesn't like to display information over TVs or monitors, and instead EVERYTHING is announced over an obnoxiously loud intercom. Eventually the airport started to fill up more, so we moved seats and counted down the minutes until we could get on the plane and finally get to our destination. Luckily, we survived the overnight layover and finally got on our small plane to Boracay. I think I fell asleep as soon as I sat down in my seat and fastened my seatbelt, and I didn't wake up again until we landed. With only about an hour of sleep to show for from the whole night, we were more than ready to get to our hotel, and after a van ride and a ferry, we were finally in Boracay and at our hotel. Since it was so early in the morning, we couldn't check into our room yet, but we changed, got some seats on the beach, and had some breakfast. Once we had the blue water and white sand in sight, the miserable time we had traveling didn't seem so bad anymore. After a few hours our room was ready, and we certainly weren't disappointed. Our room was huge, clean, and comfortable--we even had a balcony. We definitely picked the right place to stay--we were only steps away from the beach, our hotel had a great restaurant with tables with beach views, and of course most importantly, it also had a bar with friendly bartenders. Our balcony. Not the best view in the world, but you can kind of see the ocean. We spent the remainder of our day laying on the beach, napping at times, and just generally relaxing after what ended up being a rather uncomfortable journey to the Philippines. There was a lot of algae in the water our first day. Apparently this always happens in the summer. It started to go away more with each day we were there. Not such a bad life. Mojito! Can never find these in Korea! To finish off our first day, we saw some absolutely amazing sunsets before heading back to our room to finally catch up on some sleep. Amazing sunsets on our first night.